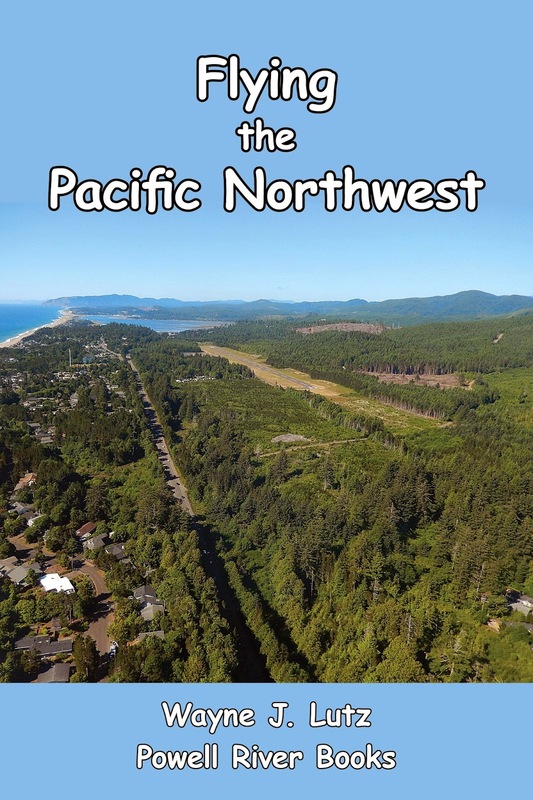 Having an airplane in the Pacific Northwest can be a lot of fun when the weather cooperates. From our home base at Bellingham Airport, we can easily hop out to the San Juan Islands in less than half an hour. Earlier this month we did just that. We took 997 out for a little jaunt to Lopez Island. This is one of the quieter spots. We've been here before to take a walk into town for lunch. It's a bit of a hike, but a pleasant one. Small Space, Big Dreams Home Awards. 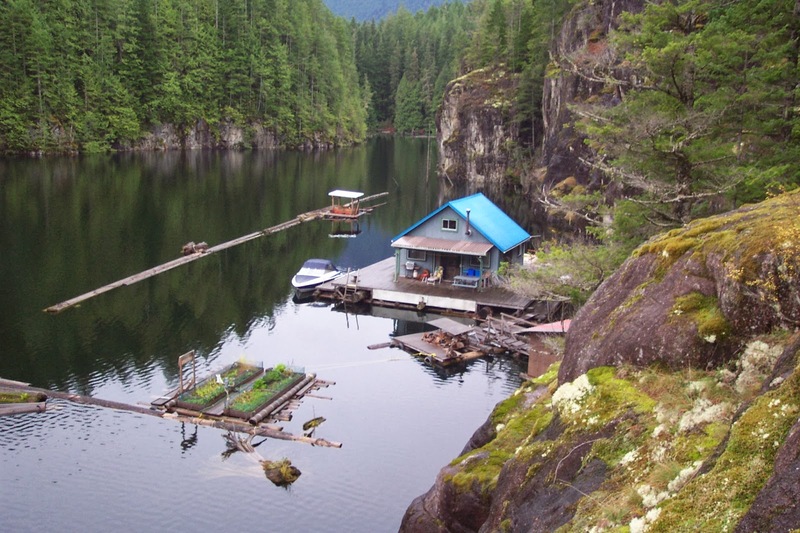 Our off-the-grid home on Powell Lake in Coastal BC not only has a water view, it has a water foundation. We pack a lot of living into 675 square feet. There’s also a floating woodshed and vegetable garden. Our tiny water access only home has plenty of space, especially with the whole outdoors at our doorstep. 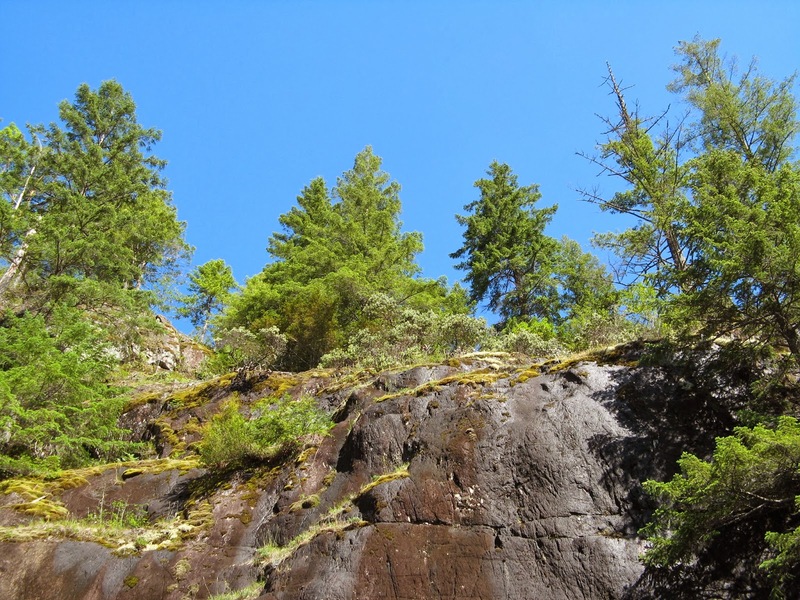 Our float cabin home is right next to a high, granite wall. In 2001, when Barry (we rented a tin boat from him to explore Powell Lake) told us about a cabin for sale, he said we wouldn't like it. The reason, a high cliff that would prevent us from going to shore. Little did Barry know that Wayne and I both love rocks. Wayne is an amateur geologist. I'm an avid rock collector. Our cliff is very important to float cabin living. We use steel cables and bolts to anchor our cabin to the cliff. It also has a natural cleft for a stairway to the top. Up on the ledge, we get a great view of Goat Island and First Narrows on Powell Lake. It's also a warm spot for late day sunshine, especially in winter. Nestled along the cliff's edge is my hillside potato patch. Who said we couldn't go ashore? We've had a meager snowfall so far this year, so we had to do some climbing into the mountains to find some. Even then, it was pretty frozen over. But that made driving and walking on the surface pretty easy. No need for snowshoes. John, his dog Bro, Wayne and I went as far as we could drive. Bro got a quad assist. He's getting up in years and walking through the snow is hard work. 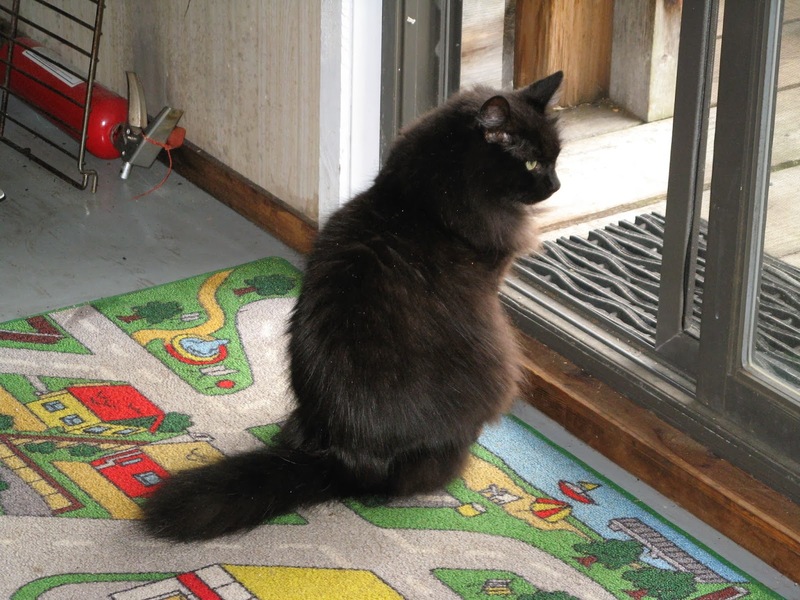 Last week I shared a post about our dear cat Stick Tail. I didn't have the heart to delete it. You see, Stick passed away on Saturday, January 11. If you follow my blog, you know that Stick has been with us for a long time. We celebrated his 23rd birthday on January 1. Since he came to us as a stray, we picked that for his special day. Stick on the stairs in his float cabin home. Stick wandered into our life and hearts (through an open kitty door) in 1991. He was bedraggled and had a shortened tail, most likely due to an encounter with a coyote. We invited him to stay. A visit to the vet gave him a checkup, shots, and a tail bob to fix the damage. His shaved tail earned him the lifetime moniker of Stick Tail. David in Pomona with his kitty Jet. Stick first lived with us in a cityfolk condo in Los Angeles. We tried to curb his outdoor ways, but old habits die hard. After Wayne and I retired in 2005, we moved north to our float cabin on Powell Lake. 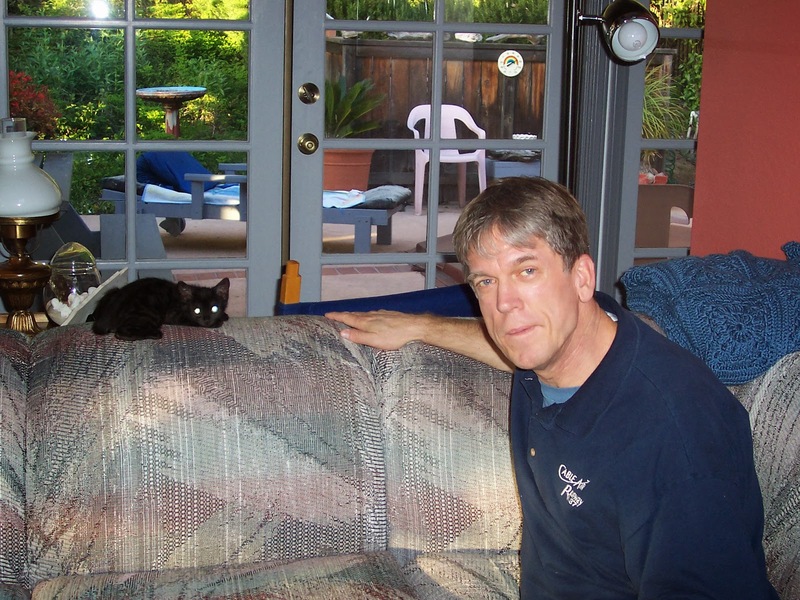 During that time, Stick had a live-in friend and kitty sitter, David. It gave David a nice place to live, and Stick a wonderful companion. In 2008, we sold our Los Angeles condo and moved Stick north to Bellingham to be closer to us, and to be a companion for my mom. We weren't sure if she would take to Stick, but it was a match made in heaven. Stick kept her company while Wayne and I were at the cabin. In 2010, when she became paralyzed, he became a constant source of comfort and cheer. Every night he would get into bed and wait for her to arrive. 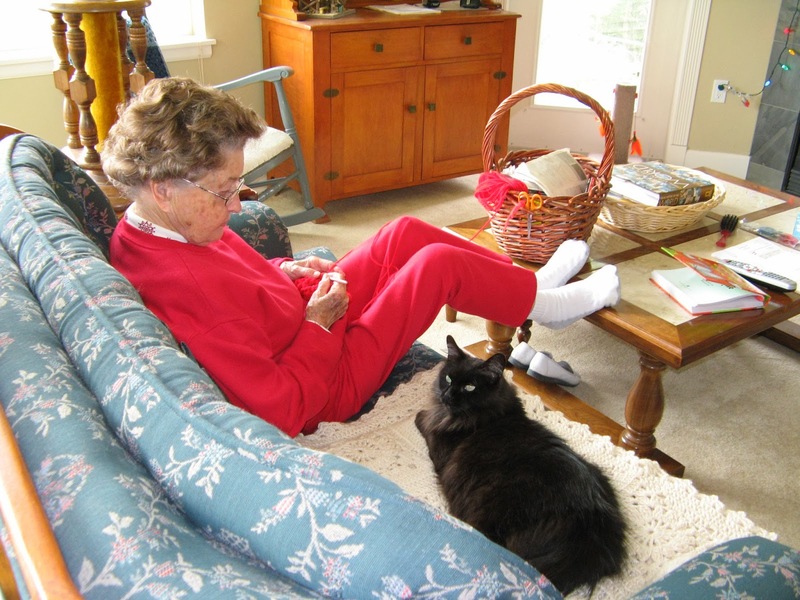 When Mom passed away at home in 2013, Stick was right there with her. 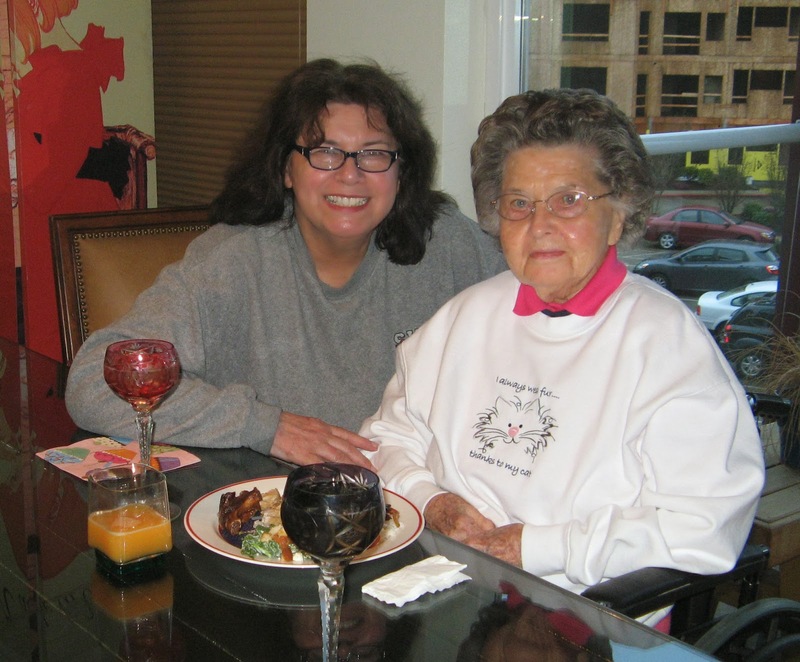 Jeanne with Mom in Bellingham. For the last nine months, Stick has been a frequent traveler, back and forth between Bellingham and Powell Lake. We think he even learned to enjoy the car, truck, boat, and sometimes airline trips. Like Mom always said, "It's just important to be together." And we were, almost 24/7 for those last months. When we had to be away, our (and his) good friend Jeanne would keep him company and keep his food bar stocked. Mom and Stick in Bellingham. Our greatest fear was that Stick would go before Mom. But as Mom's caregiver Bonita said, his job wasn't yet done. But at the ripe old age of 23, cancer came to take it's toll. The only option was surgery and chemotherapy. Wayne and I couldn't let him end his life in suffering, even though we suffered through the decision. We will be gathering his ashes and taking him home to his float cabin. Of all his homes, we think he loved the float cabin the best. 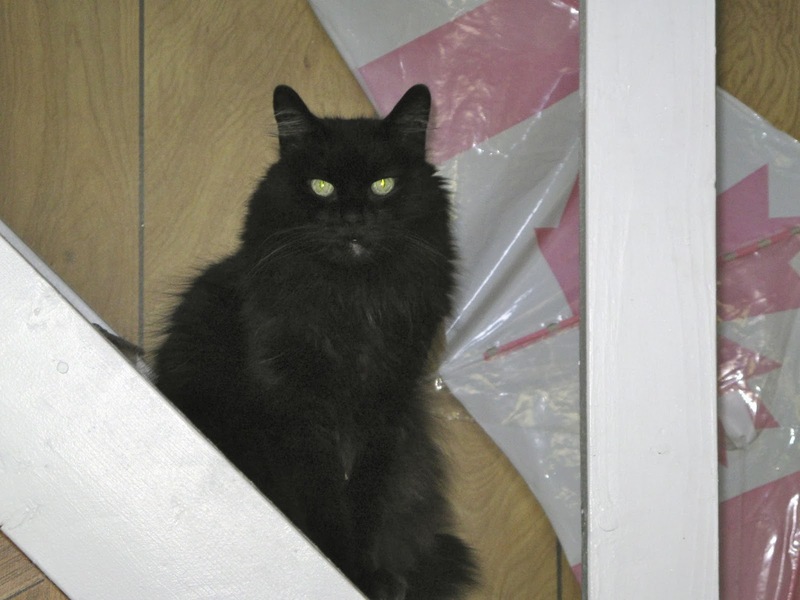 He would go up and down the loft stairs twenty times a day (and night) to check out his well stocked food bar. His upstairs sleeping pillow was covered with one of Mom's handmade afghans. Stick loved to go out on the deck and nibble green grass that grew on a cedar log out back. He would lie on the warm cedar planks, or sit between us on the sofa before a roaring woodstove fire. January is fog time in Powell River. In between rain coming off the Pacific, there are high pressure breaks that should bring us some much needed sunshine. But this time of year a forecast of "sunny" often means "foggy." The fog can cling to the surface of Powell Lake for many hours. Some days it barely rises above the surface of the water and out of the tops of the trees. On other days, the fog harbours ice. Fog depositing ice leaves frost encrusted trees in it's wake. It may be a small thing, but helmets protect our most important feature - brains. If you are in the bush, the "ambulance" may be your lifeline. If you are deep in the bush, maybe a helicopter. 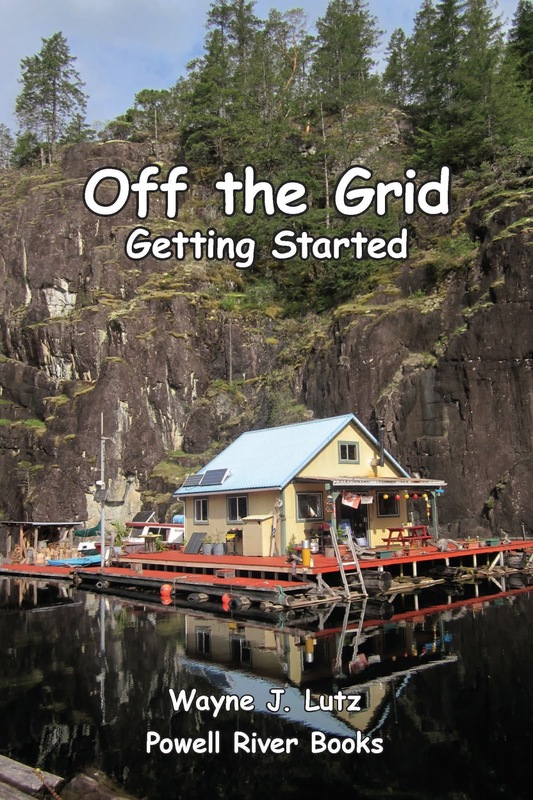 Living off the grid, you conserve energy. We generate electricity using solar power, a wind generator, a thermoelectric generator on our wood stove, and a backup gas generator. Even with all these, our batteries don't last long in winter. We don't use large electric appliances or heaters, but even energy efficient AC lights (LEDs and fluorescents) drain a significant amount of power. At Marine Traders, Jim, the owner, showed us some pre-assembled DC lights we could run off our battery packs in the cabin. We've used the DC LED emergency light that came with the pack for several years, but it doesn't provide as much general lighting as the new bulbs. DC lights are low voltage, and use virtually no power. This is a perfect solution for long winter nights. For now, we've hung two of the new lights over the sofa. Maybe we'll install some more permanent fixtures in the future. A calm day looking up the lake. 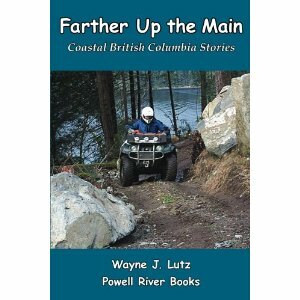 When we first came to Powell River, we heard people talking about going, "up the lake." At the time, we didn't know what they meant. Now we do! Turning around, this is the view looking down the lake through First Narrows towards town. Everything was so calm I could get exact mirror images. Our cat Stick Tail celebrated his 23rd birthday on January 1. He's getting up there in years, and now has some difficulty jumping up onto the bed. He's a spoiled little guy. He likes to snuggle up with us, but gets up and down several times a night. We hated to hear him land so hard on the floor on his way down, so we asked our good friend John to build him a stool. I refreshed my sourdough starter and decided to try a new recipe, Cheddar Cheese Sourdough Biscuits. These biscuits combine sourdough starter, baking powder, and baking soda as leavening agents. The result is denser than biscuits made only with baking powder, but the tang of the sourdough makes them a tasty treat with a soup, salad, or chili dinner. I found this recipe in my favourite sourdough recipe book, Sourdough Cookery by Rita Davenport. Mix dry ingredients. Cut in margarine until the mixture looks like fine crumbs. Stir in 1/2 cup grated cheddar cheese. Drop biscuits by the spoonful onto an ungreased cookie sheet. Let rise for 15 minutes in a warm place. Bake at 350 degrees for 20-30 minutes or until golden brown. Remove from pan quickly. Serve warm with butter. As Canadians are oft to do, we follow the geese south for the winter. When temps get cold and skies are gray for days on end, we hunger for the sun. Wayne and I've made our way to Tucson, Arizona. In addition to some great USC Women's Basketball Games, we visited the Titan Missile Museum in nearby Sahuarita. The tour includes a video presentation about the Titan II Missile program that lasted during the height of the Cold War. Double locked launch codes and keys. The museum guides (some of whom worked in the silos during their military careers), take you down into the missile complex underground. You follow the same entry as officers and enlisted men from years past. The tour is handicapped accessible using the former supply elevator. Cableway between the command center and missile silo. The first stop is the underground command center. There the guide leads you through a simulated launch, explaining what life was life below ground during a standard 24-hour tour. Looking up at the nosecone where the nuclear warhead would be housed. A walk through the cableway tube leads to the silo. You see the Titan II missile as it would have looked, ready to go, armed with a nuclear warhead. Of course, that part has been removed. Looking down into the 150 foot deep silo. I grew up in the 50s and 60s, experienced the Cuban Missile Crisis, and all the drop and cover drills in school. Now with worldwide tensions somewhat lessened, nuclear arsenals have decreased. But they're still there, acting as deterrents. I pray that works. The alternative is too horrible to imagine. Looking down from above through the open retractable silo door. Here is a YouTube video by Wayne Devin about the museum tour. On sunny days up the lake, we like to explore. In several places there are logging docks. During off hours, you can use them to access shore. Last week we headed up to Olsen's Landing. In the early 1900's, families who lived in the remote Olsen Valley would bring garden vegetables down to Powell Lake. 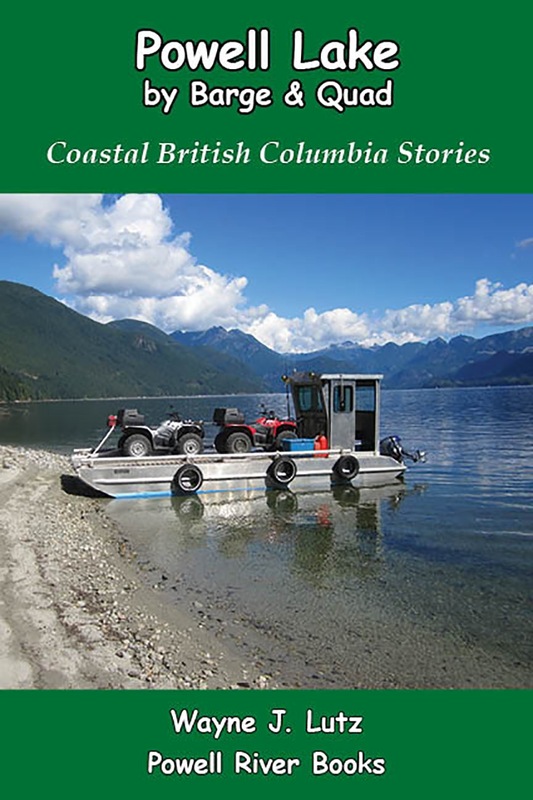 From here, they would take them by boat to Powell River for sale. 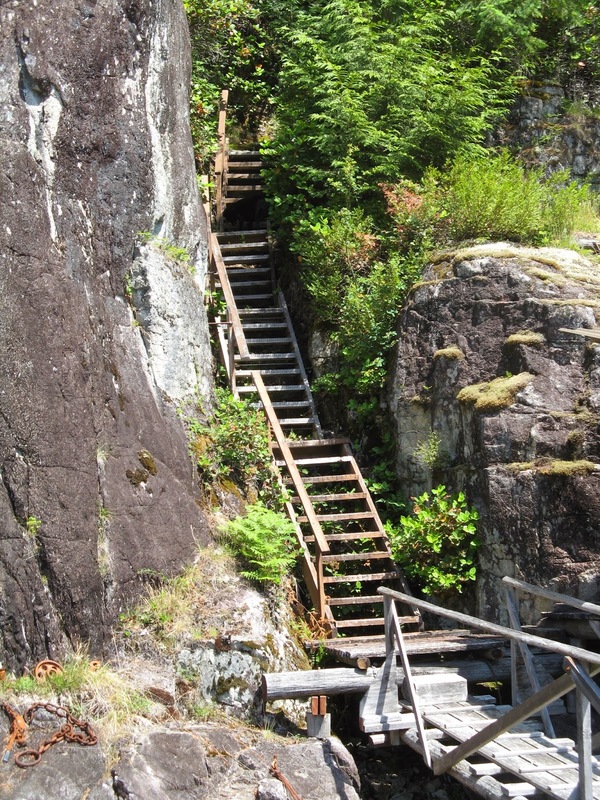 Today, the landing is used by logging companies to extract logs and cedar shake blocks to transport down the lake to Block Bay. Several years ago, Wayne and I discovered an unusual phenomenon while on a quad ride. It's called frost beard or flowers. In our area, it's most often seen on fallen alder trees and branches. The frost formations occur in freezing weather before the ground is frozen. Moisture trapped under the bark or rising in the stem expands, causing long, thin cracks to form. Wayne and I took our Hewescraft farther up the lake (now you know where the book title comes from) last week. At our cabin, the sun sets behind the trees at 11:30 am. Yet, the sun was shining bright out beyond the narrows. Out on the lake, there was still plenty of "warm" sunshine to enjoy. We headed to the dock at Olsen's Landing to take a short hike up the logging road. At the bridge over Olsen Creek, we could see some of the the results of recent winter rains heading for Powell Lake. At the cabin, we monitor the weather,. We keep a log so we can compare month to month and year to year. This December we had about 10 centemetres (4 inches) of rain. That's about half of what we got last year. For this time of year, the lake level is way down! 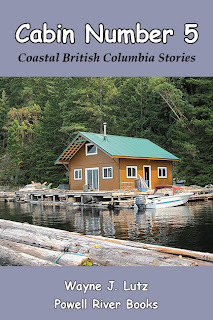 When we got home, we discovered the large floating log that forms the boundary of our "swimming pool" between the cabin and the granite cliff had gone aground. Wayne got busy with a crowbar to nudge it back in place.